The Mayfair Serving Tray features the Mayfair design that you find on other Mayfair furniture pieces by Hanamint. The serving tray mimics the look of a Mayfair dining table, you’ll notice. 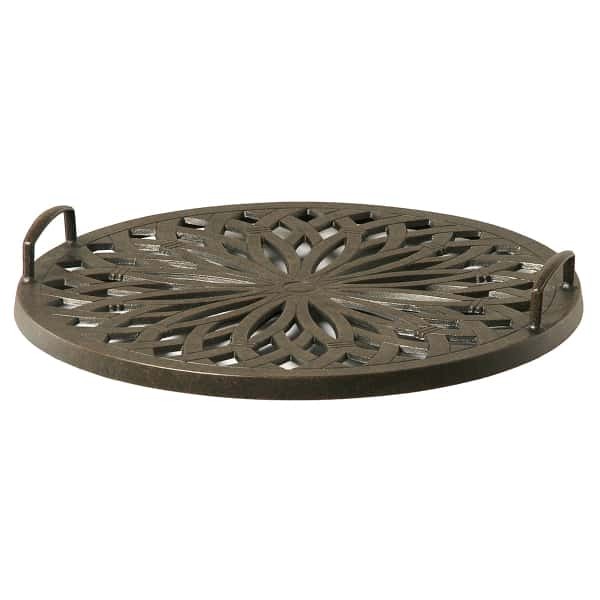 Thus, the Mayfair Serving Tray may slip in with beautiful ease into your outdoor dining setting. Or, as it is versatile and classic in material and finish, it can slip into a different setting of Adirondack chairs or sporting chairs. The biggest perk of the Mayfair Serving Tray is the sturdiness of the tray, including the handles, which allow for carrying large items. And, the Mayfair Serving Tray is made to resist all forms of inclement weather, whether saltwater, freshwater, UV ray or wind. So, you don’t have to sweat it if you leave it outdoors during summer showers. Enjoy the cast aluminum construction, which features one single piece of aluminum rather than multiple pieces held together by nuts and bolts that rust, squeak and get lost. Now, that’s convenience!